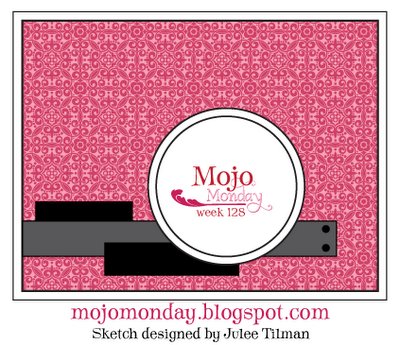 I've been so busy with my new job that I haven't had much time for challenges lately and there were two that I really wanted to participate in - Mojo Monday and the Bits and Pieces challenge on the Moxie Fab World blog. 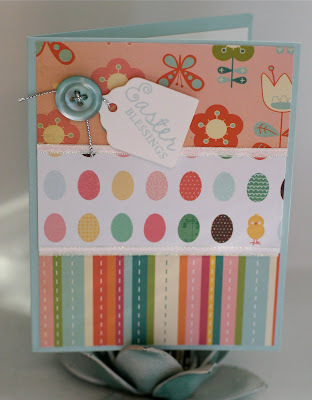 I started designing this card for the Mojo challenge (which I flipped vertical) and was so happy to be able to use the scraps from our Easter cards! Once I had it put together, I thought it would be perfect for the Moxie challenge, too! I really like how the patterns seem to work together even though each is very busy on its own. 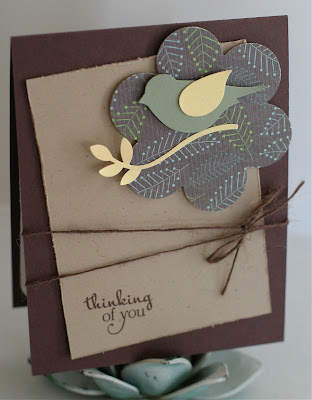 Ink, Cardstock - Stampin' Up! "Soft Sky"
DP - Cosmo Cricket "Girl Friday", American Crafts "Dear Lizzy"
Button - PTI "Aqua Mist"
I can't believe Easter is a week from Sunday! We don't have any big plans this year but will go to services and I always like to cook a ham. Though, we did have a giant ham for Christmas so not sure we're ready for another one quite yet, lol. 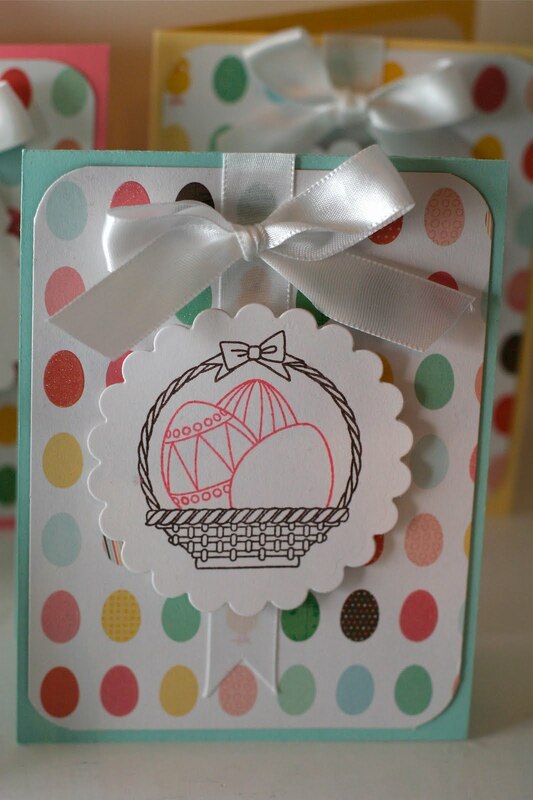 Here are the Easter cards we're sending to family this year - I used the lovely "Spring Baskets" set from Waltzingmouse. The sentiment on the inside is just perfect - "Faith is putting all of your eggs in God's basket." Love it!! Stamps - Waltzingmouse "Spring Baskets"
DP - American Crafts "Dear Lizzy"
My "Glorious Spring Wishes" card is featured in this amazing Spring Blog Carnival put on by the wonderful folks at Craft Critique. Hop along for some wonderful spring craft ideas! 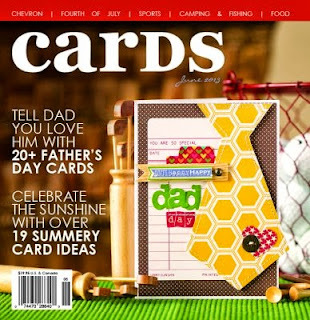 I have been following Craft Critique for about a year now - really since I started honest to goodness card making/crafting. 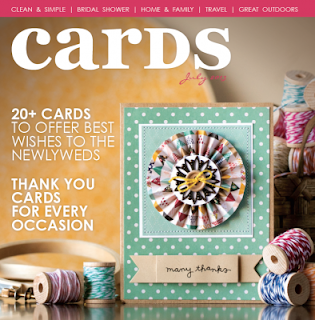 That site is my go-to for new crafty tools and ideas and their critiques are well documented and help so much when making choices for crafting projects. I've been thinking lately that I just don't blog enough! I make cards all the time but the discipline of getting all those ideas online is a bit daunting, especially because I think I have to tell some elaborate story about how I was inspired, my creative process, and so on, and so on. Well, to that end, this little blog of mine has seen precious little of what I've made over the last year or so and it is time to change that! Ok, I'm out - gotta learn how to keep it short! 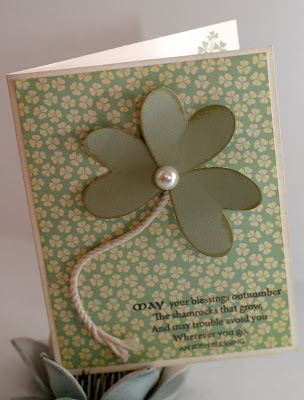 Welcome to another fabulous blog hop with Waltzingmouse Stamps! If you've come across this post any other way, head on over to the Mouse House or to Claire's Blog to get started! 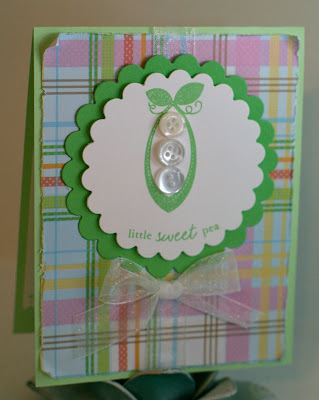 I had a lot of fun making this pretty card courtesy of Waltzingmouse Stamps and some amazing paper from Cosmo Cricket! 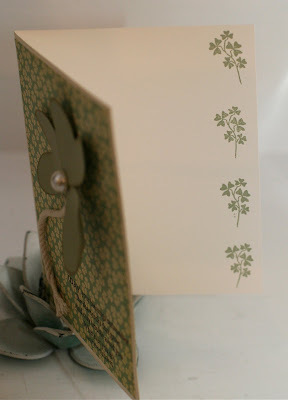 Stamps - Waltzingmouse "Irish Blessings"
Ink - SU! "Sage Shadow", "Chocolate Chip", PTI "Tea Dye Chamomile"
Cardstock - SU! "Sage Shadow", PTI "Vintage Cream"
DP - Cosmo Cricket "Earth Girl"
Is it just me or is everyone expecting these days? 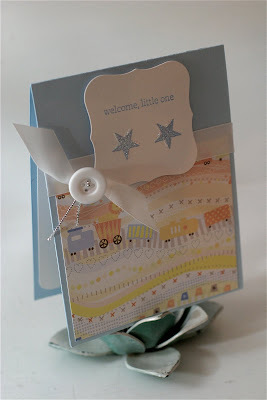 Some days I feel like I went from making Christmas cards to making congrats, welcome baby, you're invited to a baby shower cards and haven't looked back! I have recently connected with my best friend from HS after about 15 years (thank you, Facebook!) and she asked me to make a "Congratulations" card as her sister is expecting! My honor and privilege, for sure! Anyway, made a few cards for her to choose from and will make coordinating tags and some other goodies to send up with the cards. I just got Papertrey Ink's "Baby Button Bits" this week (i didn't jump on it and it was on backorder for what felt like forever) and had a blast getting it all inky tonight! Fun fun fun!! This card was inspired by the Cinema Saturday movie (drumroll, please...) "Spiderman" and Brooke and Sankari's challenge to use (another drumroll...) acetate! I love "Spiderman" - the reluctant superhero, love triangle, making a better life for family - all classic movie themes and so many ways to be inspired! I used a great hero sentiment from Verve and the traditional superhero colors of red, white, and blue. 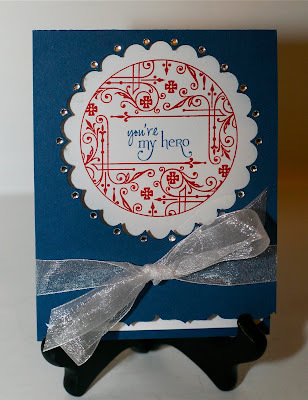 I'm just in love with the deco-ish circle stamp from Waltzingmouse and have used it all week. If you follow this blog a bit, be warned, I'm sure you will be seeing more of it, lol! I cut out the center of the front of the card using a circle scallop nestie and cut out the slightly bigger scallop for the panel to cover the scallop cut-out (attached on the inside.) The red circle sentiment was stamped on the inside panel of the card.